Fall under the spell of the enchanting Amalfi coast where the most beautiful coastline in the world offers incredible views throughout its course. Your day tour of the Amalfi Coast begins from Naples and travels along the scenic Amalfi Coast. Stroll around the narrow alleys of Positano that enjoy an unsurpassed position along the Amalfi coast where delightful white and pastel-colored houses litter the hillside. Along with the beautiful beaches, its ancient fishing port, the splendid majolica dome of the church of Santa Maria Assunta and artisan shops you'll enjoy a taste of the Dolce Vita. 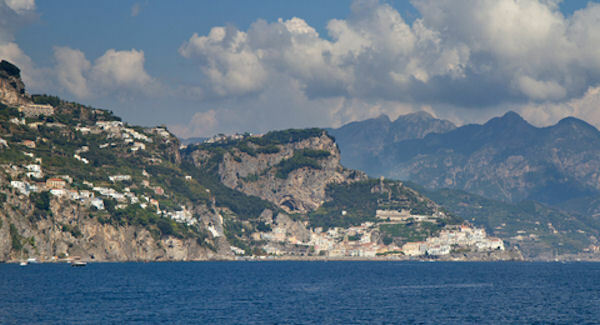 The town of Amalfi enjoyed a prestigious past when it was a major naval power. Made of a labyrinth of narrow lanes and alleyways that climbs the surrounding hills, the town features typical Mediterranean style architecture with houses piled one on top of the other. Here you can sample the local Limoncello drink or perhaps visit the celebrated Paradise Cloister built in Arabian style that dates back to the 13th century. The tour concludes with a visit to the town of Ravello, sitting high up above the Amalfi Coast. Here we can visit the famous Villa Cimbrone, where from its terrace nicknamed Terrace of Infinity you can enjoy incredible views of coast. A stop in Ravello and or Positano depending on the timing of the day. If possible both will be done but congestion on the roads may limit timing. Don't forget your camera. Please be aware the roads on the Amalfi Coast are narrow and winding. Passengers who suffer from motion sickness should take this into consideration. Time permitting we may add a stop at Pompeii.